Synopsis: In the epic origin story The Legend Of Hercules, Kellan Lutz stars as the mythical Greek hero – the son of Zeus, a half-god, half-man blessed with extraordinary strength. Betrayed by his stepfather, the King, and exiled and sold into slavery because of a forbidden love, Hercules must use his formidable powers to fight his way back to his rightful kingdom. If the history of cinema has taught us anything it’s that any iconic character deserves an origin story. Some, like Michael Corleone, get one, while others, like demi-god Hercules, get dozens. And although there can be success in the repeated origin story, failure is an all too common outcome. Enter The Legend of Hercules, a new origin story for the iconic character…in 3D! 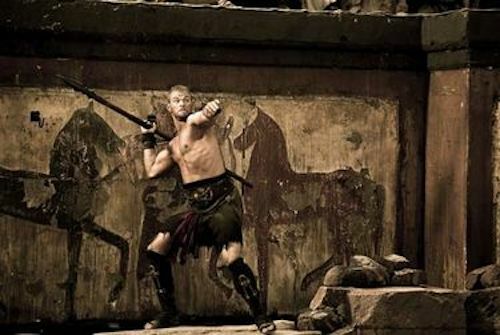 In this particular tale, the son of Zeus (played by Kellan Lutz) is more or less Spartacus, a warrior of noble birth who is forced into battle as a slave. He wants nothing more than to be with his love Hebe (Gaia Weiss), but his simply being alive is a perceived slight to his “father,” and so he is betrayed, left for dead, and then brought up as a brawler. As you might expect, Hercules shows signs of great strength as a fighter, and his charismatic arena presence earns him a trip back to his hometown and a chance at redemption. But don’t be fooled by that well-worded synopsis, The Legend of Hercules is as trite as they come. It’s an artifice that chooses to be no more ethereal than the myths on which it is based. Take the film’s opening sequence, for example, a one-on-one battle that has no set-up and relies all too frequently on speed ramping to generate excitement. In that 5-minute scene, the film tells you all you need to know. It establishes that for the next hour and 45 minutes style will dominate substance, and any hope at a comprehensible, let alone enjoyable, story is lost. It starts, quite awkwardly, with the casting of Lutz, who is nothing more than a sun-soaked piece of cardboard – a muscular, emotionless “bro.” Although Hercules is set up to be a charismatic and compassionate hero, none of those ideas are effectively communicated by Lutz’s performance. Rather, here is an actor who was cast to capture a particular demographic, and because…well…because he has muscles. The supporting cast is a little easier to tolerate, but they are mostly caricatures. Everybody fills his or her pre-determined role in a serviceable fashion, but no single performance is what you would call memorable. In fact, it might be easier to root for the film’s main villain, Hercules’ “adoptive father” Amphitryon (Scott Adkins), who is at least a little bit dynamic. Ultimately, The Legend of Hercules is little more than a glossy version of Spartacus (the Starz television series, not the movie), but without the gore and intrigue. The story is, at best, a series of cliches that play out exactly as you might expect. At worst, it’s a pointless rehash of tales we’ve seen time and time again. The acting is poor, the action has a ton of problems, and there’s nothing exciting about the film. There are greater Hercules stories out there, seek them out and avoid this one at all costs. Despite a flawed story and weak acting, there will still be those who flock to The Legend of Hercules in the hopes the film delivers exciting action. Unfortunately, The Legend of Hercules is a prototypical example of nearly everything wrong with action flicks these days. In an age where camera tricks are affordable and easy to execute, The Legend of Hercules “buys the farm” in that regard. It uses slow motion or speed ramping at nearly every opportunity, regardless of if the scene warrants it. The choreography is similarly stylized, but far less obtrusive than the camera tricks. You might even say a few of the fight sequences are passable, if hugely anachronistic, but that’s before the incessant speed ramping throws any of that potential away. Then come the final, CGI-heavy set pieces of the film. Up until these scenes, The Legend of Hercules might be seen as a moderately entertaining simulacrum of 300, but that feeling doesn’t last long. Once Hercules starts showing his godly abilities, things get head shaking silly. From the 3D to the CGI, The Legend of Hercules chooses to play down to its audience, but does so without being creative or exciting. It’s a senseless parade of all the whiz-bang tricks you’ve seen used a dozen times over and to greater effect.